!st floor has large 'L' shaped living room with kitchen, 2 bedrooms, bathroom and separate WC. This floor is fully air-conditioned. It also has a large balcony great for eating 'alfresco' and 3 other smaller ones to make the most of the sun. 2nd floor has two bedrooms, 2 living rooms each with double sofabed for 2 people, 2 kitchen areas and 2 bathrooms. These bedrooms are air-conditioned and ceiling fans cool both living rooms. This floor has a large balcony and 4 other small balconies with lovely views of the olive clad hillsides and the Pagasitic Gulf in the distance. Outside is a shady fully enclosed garden with fruit tress, grassed areas, tables and chairs and 2 BBQs. Childrens' play area with swings and slide for young children. In the centre of Amaliapolis you will find a choice of cafes/bars and tavernas, with excellent fish within walking distance of the villa. The village also has two bakeries and two general stores. The beach is also about 7 minutes walk from the villa and is sandy and gently sloping - making it very suitable for young children. There is also a children’s playground, 5-a-side football pitch and volleyball court next to the beach. There are 2 beach bars which also provide sun loungers for the price of a drink. As well as the sandy village beach there are several good beaches within a 30 minute drive dotted around the west side of the Pagasitic Gulf. You can also take a boat trip to the island of Skiathos with its famous sandy beaches. This part of the Greek mainland has much to offer the visitor with beautiful seaside villages, sandy undeveloped beaches and forested mountainous areas with traditional settlements to explore - all largely unaffected by international tourism. The city of Volos is a lively university town well known for its 'tsiopuradika' - small restaurants where you can drink the local ouzo 'tsipouro' and sample the mezze that come with it - a sort of Greek tapas. It also offers hydrofoil links to Skiathos, Alonissos and Skopelos where 'Mama Mia' was filmed. The Pelion peninsula is well worth a visit with spectacular scenery and a ski-resort in winter. If you want to venture further afield both classical Delphi (approx 120km) and the Byzantine monasteries of Meteora (approx 180km) make fascinating excursions as does the lesser known but stunning archaeological site of Dion (approx 170km). It is also possible to visit Vegina and Pella near Thessaloniiki for those who are keen on archaeology. The villa has 4 bedrooms with 2 single beds in each. Additionally there are 2 double sofa beds in 2 of the living rooms allowing an extra 4 people to be accommodated, making 12 in total. 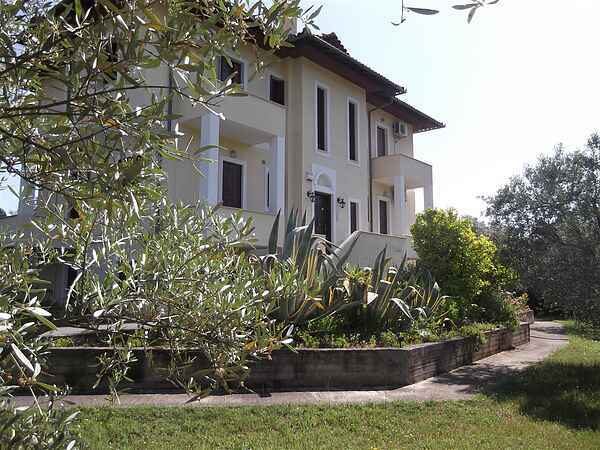 Please note this villa is offered as a furnished rental on a self-catering basis and does not provide any additional services such as cleaning.